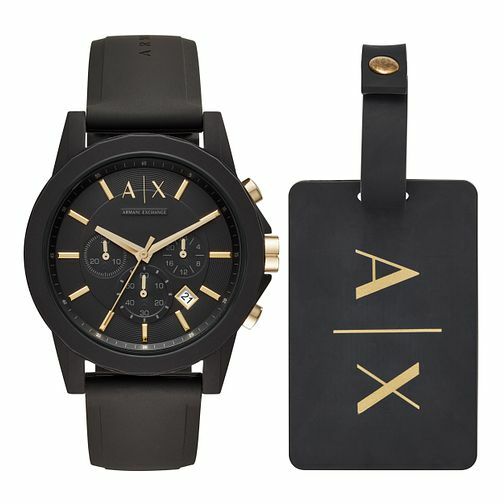 Armani Exchange have designed this sleek Outerbanks watch with the modern man in mind. With a comfortable, hard-wearing black silicone strap with a matching black casing and dial, this watch will suit any look and any occasion. With distinctive gold tone elements in the dial and the crown, this watch will still make the perfect impression. This watch also comes with a matching leather travel tag, meaning with accessories will always be perfectly matched and perfectly on-trend. Armani Exchange Men's Silicone Strap Watch Set is rated 5.0 out of 5 by 3. Rated 5 out of 5 by Anonymous from Lovely watch, trusted website worth spending a little more for genuine product. Was looking for a Valentine gift and knew this armani watch would be perfect but when shopping around for similar products, I noticed the fluctuation in prices and was concerned about receiving an authentic product from other website's, so I chose a trusted name in hsamuel. Secure and speedy delivery was a real comfort. Arrived just outside of estimated window. Was disappointed with gift packaging and personalised gift card never arrived even after contacting customer service. Rated 5 out of 5 by Anonymous from Quick service Product was an amazing deal & came within a few days of purchase, with tracking & perfect condition.